RoyalEnfields.com: Stolen from Germany, the Royal Enfield Flying Fleahelped beat the Nazis, then invaded the U.S.
helped beat the Nazis, then invaded the U.S. 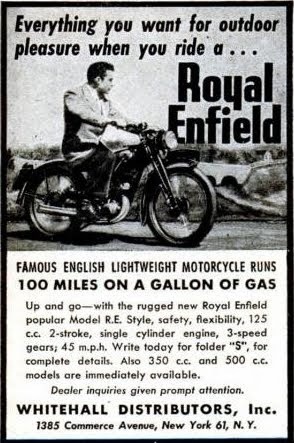 The Royal Enfield Model RE was advertised in the June 8, 1947 Brooklyn Daily Eagle as "the NEW famous English lightweight!" The ad promised 100 miles per gallon and a Smith chronometric speedometer, tool kit and tire pump for $325. Eleven area dealers were listed, including two Pontiac dealerships, a Hudson dealership and a variety of bicycle shops as well as the Jamaica Stove Supply Co.
May, 1948 ad in Popular Science. The ad boasted that the motorcycle was proudly "Distributed in the U.S. by WHITEHALL DISTRIBUTORS, Inc., 1385 Commerce Ave., New York 61, N.Y."
Just after World War II ended Royal Enfield — with the help of Whitehall Distributors — brought thousands of motorcycles to the United States. These weren't all the big singles or fabulous twins we remember so well today. Most were the 125cc two-stroke Model RE — the motorcycle most people recognize by its nickname, the Flying Flea. The nickname comes courtesy of the model built to be air-dropped to British paratroopers during the 1939-'45 World War. From 1946 to 1949, equipped with a bargain price, but no parachute, the Model RE peacefully invaded America by sea. Hundreds more would come in later. After 1955 updated versions even appeared in numbers on the American market badged as the Indian Lance. But it's that immediate post-war surge that catches the attention. It's a surprising number, dwarfing the number of other Royal Enfield models imported in those years. They met with apparent success. One Miami dealer claimed to have sold 1,000 Royal Enfields in a year. At his advertised price of $129, these could only have been the little Model RE. It turns out that Whitehall Distributors knew a lot about the motorcycle it was importing — the motorcycle that became the Flying Flea had been their idea, all along! A bit of background about the Model RE: It was largely a copy of the German DKW RT98 motorcycle. The DKW was popular in Holland before World War II, but the Rotterdam importer, R.S. Stokvis en Zonen, had Jewish directors. In 1938 the Nazis had the concession given to someone else. The original Dutch importers defiantly turned to Royal Enfield for a copy of the RT98. The imitation that Royal Enfield produced was called the "RB" (for Royal Baby) to deliberately exploit the connection to the DKW "RT." After 1939 the little two-stroke went to war for the British as the Flying Flea, and it remained in production post-war as the Model RE. Blogger Jorge Pullin compiled the early history of Royal Enfield in the United States on his blog My Royal Enfields. Jorge wrote how Royal Enfield's Major Smith, Major Mountford and Miss Jean Smith, Major Smith's daughter, toured the U.S. in 1946. "They stayed 10 days in New York and arranged for an American distributor, Mr. Edward Stokvis of Whitehall Distributors Inc. to sell the motorcycles in the U.S.," Jorge wrote. He goes on to document the many contacts between Royal Enfield and Whitehall, and with Whitehall's vice president John Stokvis. "It started when Mark Mumford read Jorge Pullin’s article of July 5, 2012 and made the connection that Whitehall owner Stokvis & Zonen is the same partnership that lost their DKW dealership in Rotterdam in 1938 for being Jewish owned. They sent a DKW RT98 to Royal Enfield to duplicate. This was the Royal Baby (RB 125) that became the Flying Flea, the Model RE, Ensign, then Prince 150." Graham wrote: "I did not know that Stokvis was manager at Whitehall (thanks Mark), but would agree that it is probably the same person." And he found the evidence to back that up. His "quick trawl" of the records showed Royal Enfields being shipped to Stokvis & Zonen in Rotterdam in 1939 and 1940 and then again after the war. Then, in 1946 shipments started to Stokvis & Zonen in New York. This continued until October of that year, when the destination name changes to Whitehall. "Edward and his partner began trading again after the war in Holland in April, 1946. It would appear that they also set up business in New York two months later, changing the name to Whitehall," Graham concluded. How odd to think that the very people who stole the Flying Flea design from the Nazis brought the little Royal Enfield to the U.S.
At the time, the Dutch connection to the Model RE in the U.S. probably seemed incidental to all concerned. Whitehall Distributors had other lines. It sold "Petroslips" tablets to improve your gas mileage (one tablet for five gallons of gas; just 98 cents for a box of 12). R.S. Stokvis & Zonen, now gone, was a large and very old firm, founded in 1849, with many automotive and motorcycle interests among other products. The Royal Baby forms a very small part of its corporate history. They traded mostly in industrial items like electric devices, machines, cycles, motorcycles and real estate, but also textile, in short anything that could bring a profit. Edward and John Stokvis were of the 4th generation who worked in the family business. Eventually they emigrated to the USA.